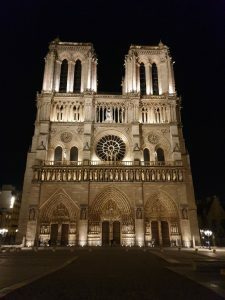 With great sadness we have witnessed the recent news on the destruction of the iconic Notre Dame Cathedral in Paris, a UNESCO World Heritage monument. 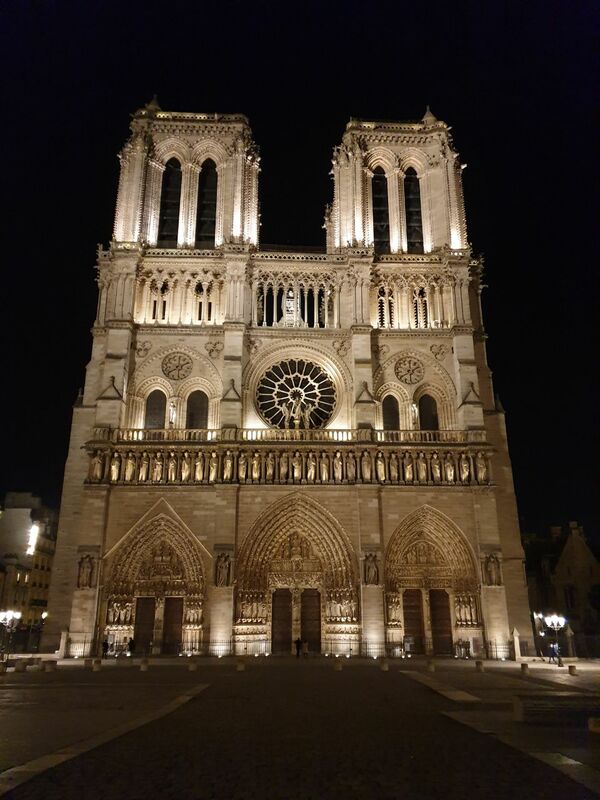 The KM3NeT Collaboration, with a significant participation from French Universities and Research Institutions, offers its full support and sympathy to France and the people of Paris, hoping for a quick restoration of the Notre Dame. 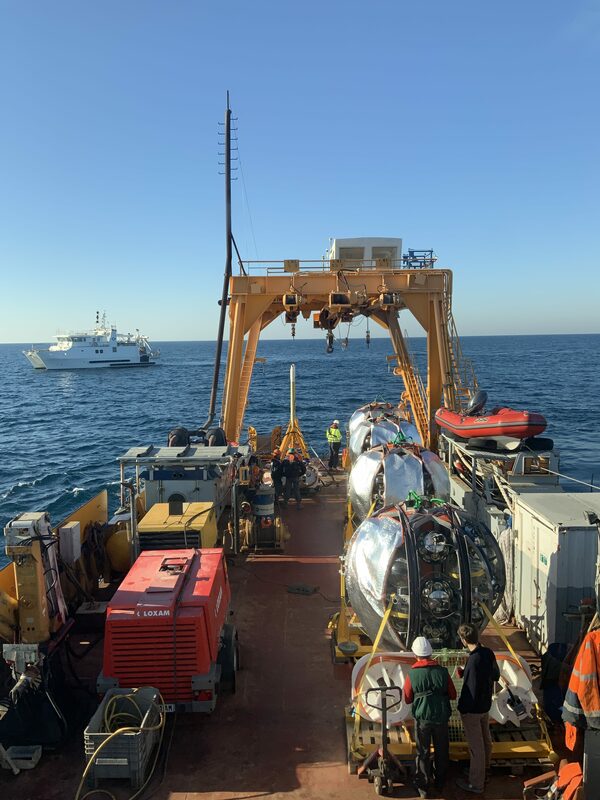 8 March 2019 – Last month, the KM3NeT team of CPPM, Marseille together with the ship crews successfully installed an ORCA detection unit. 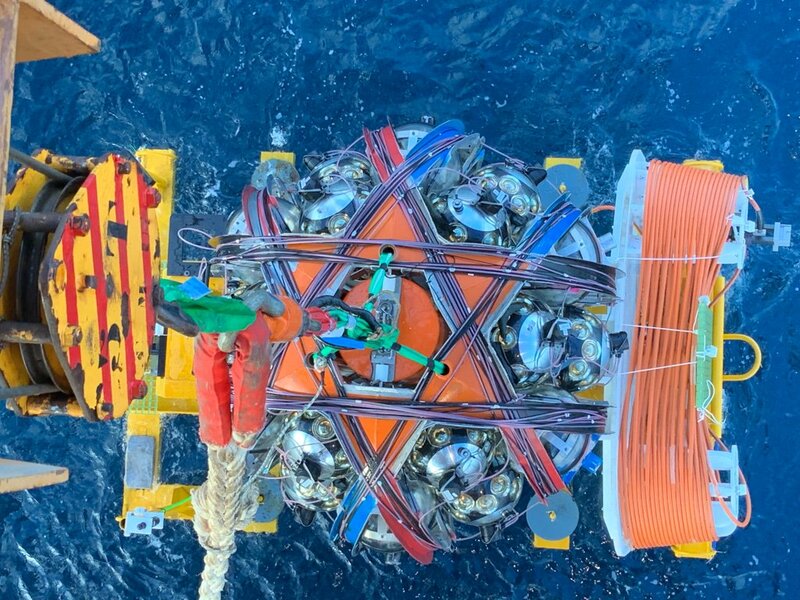 It was the first unit connected to the refurbished main electro-optical cable to shore. After a few weeks of technology tests, the unit is given free for physics runs. ORCA is operational! Unfortunately, after the deployment of one unit, the winch of the heavy lift line failed and three other units could not be deployed. They will be deployed during the next sea campaign. In the mean time, KM3NeT researchers have taken up the duty of 24/7 shifts overlooking proper functioning of the detection units at both the ORCA and ARCA site. It is a pleasure to watch good quality data streaming to shore. 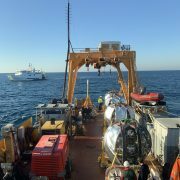 Pictures below: Four detection units in their deployment mode on deck of RV Castor (left), the package with the detection unit hanging on the heavy weight lift line just above the water surface (middle) and a plot of the signals that a down-going muon particle leaves in the detection unit: height vs the time of the recorded light signals (right). 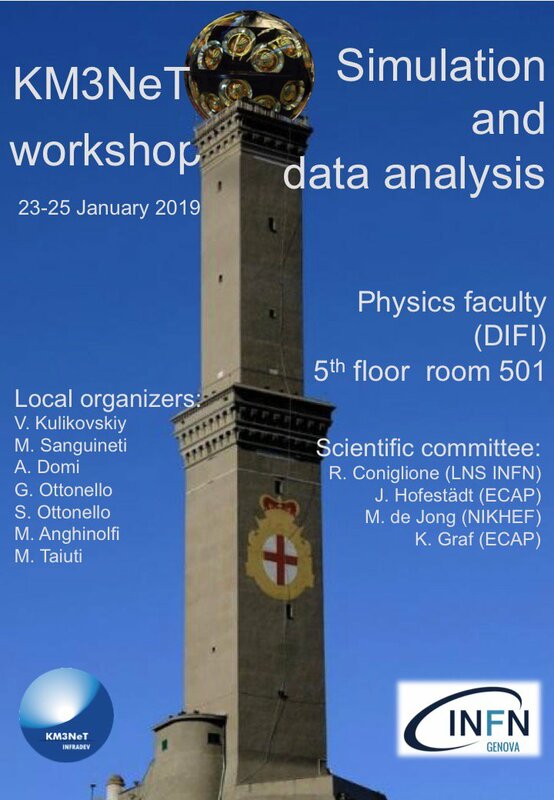 23 January 2019 – An internal KM3NeT workshop on ‘Simulation and Data Analysis’ was organised at INFN – Istitutio Nazionale di Fisica Nucleare in Genova, Italy. 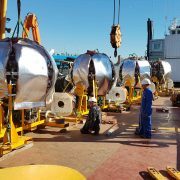 In the last two years the ARCA and ORCA sites were equipped with the first detection units which allowed for obtaining the first calibration data. 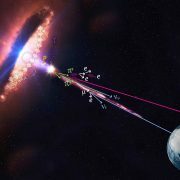 The data comprises many measurements of muons created in the atmosphere. These measurements, although background to the neutrino signal, are extremely useful for the understanding of the detector performance and improving detector calibration and simulations of the detector response. The aim of the workshop was to review the currently existing simulation software tools and tuning them to reach agreement with the collected data on a new precision level. Simulation of background events comprises very computationally intensive tasks, which must be run on the GRID and cloud infrastructures. For this, automatic workflows for the software deployment and running on different computer infrastructures were discussed and tests have been started. 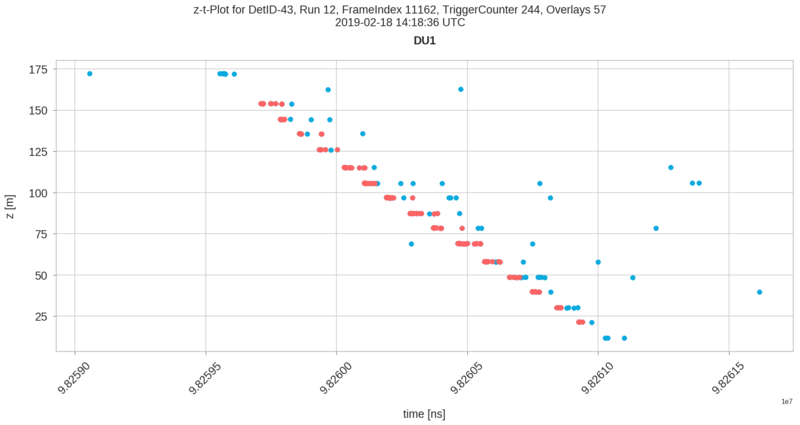 The simulation workflows also should keep provenance of the data to allow for repetition and tracing of each simulated event. Automisation of the quality control of the data and simulation is yet another key task addressed at the workshop. 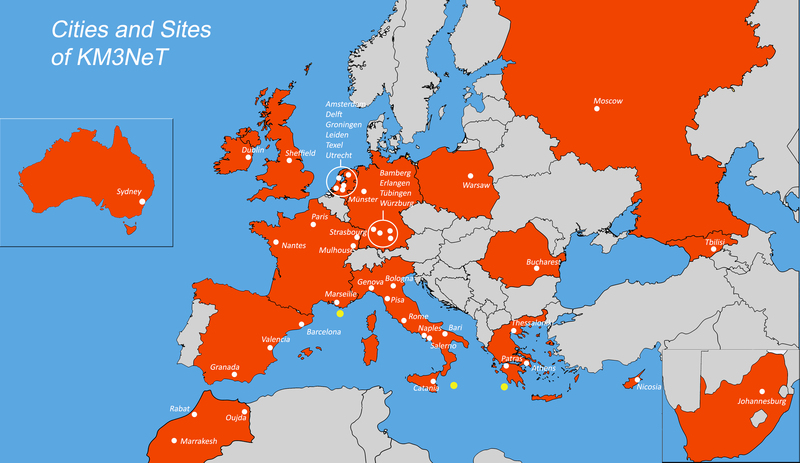 20 November 2018 – As an ESFRI research infrastructure for neutrino astronomy and particle physics, KM3NeT actively participates in the new ESCAPE science cluster that will address Open Science data challenges shared by the participating European large research infrastructures for astronomy and particle physics. Early 2019, ESCAPE will be launched officially. Read the press release and the project summary. 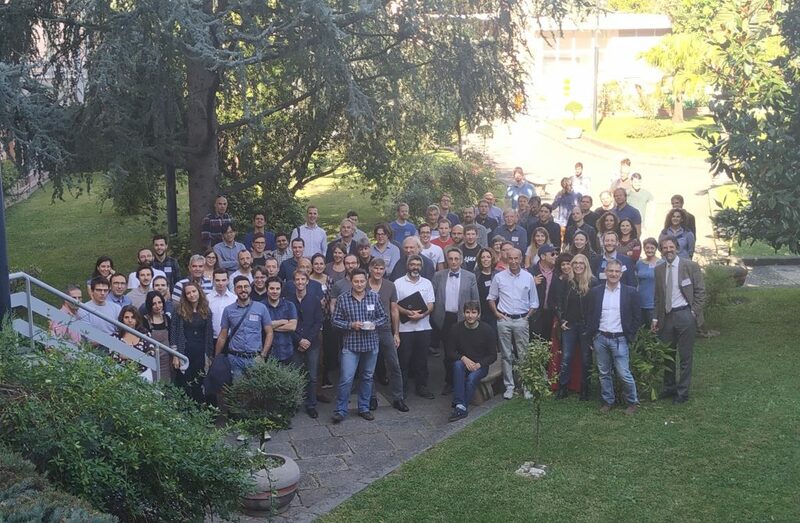 This week, 22-26 October 2018, researchers and engineers of KM3NeT are in Caserta, Italy for their annual Fall-meeting. 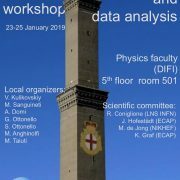 The meeting is organised by the colleagues of the KM3NeT team of INFN/Naples. A week full of presentations and discussions in parallel and plenary sessions. Today we are looking forward for an excellent Italian Collaboration dinner. 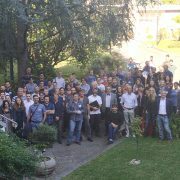 Thank you, Pasquale Migliozzi and your organising team for hosting us! 23 October 2018 – KM3NeT proudly presents its new management team! In a few months from now, at 1 February 2019, the new management team will take over from the current one for a term of two years. 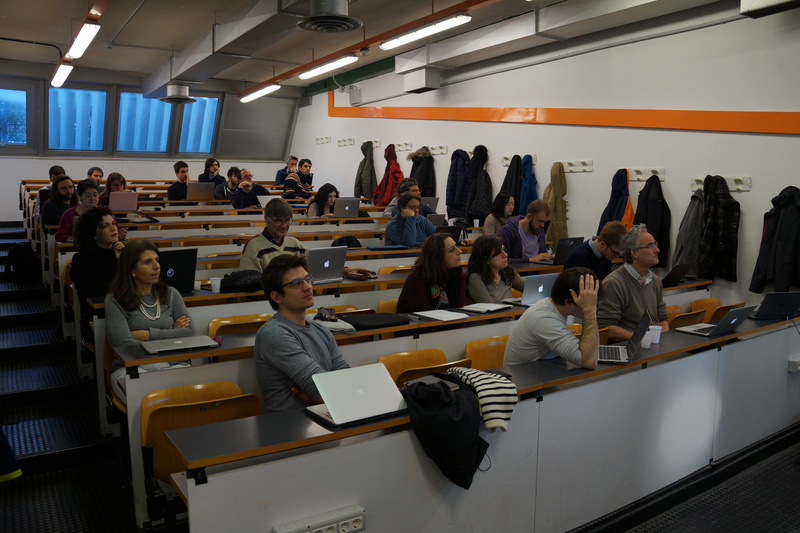 Mauro Taiuti chairs the team as the Spokesperson (Director) of the KM3NeT Collaboration. He shares the tasks with Aart Heijboer, who is the Deputy Spokesperson. Miles Lindsey Clark is the Technical Project Manager and Paschal Coyle the Physics and Software Manager. 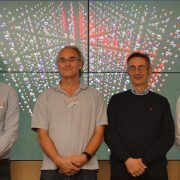 Together they will lead the KM3NeT Collaboration of researchers and engineers in their endeavour of building the ARCA and ORCA neutrino detectors, taking data and searching with deep learning techniques and complex algorithms for signatures of neutrinos. The KM3NeT Collaboration has great confidence in the team and congratulates all four members with their election! KM3NeT wishes all XPRIZE finalists good luck! During November and December 2018, KM3NeT will follow with great interest the sea operations of the finalists of the Shell Ocean Discovery XPRIZE. The Shell Ocean Discovery XPRIZE is a global competition for innovation in deep sea technology. 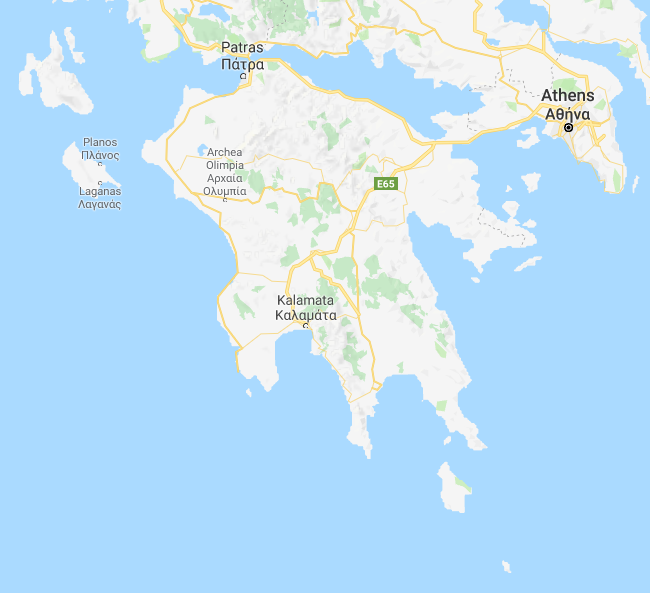 The challenge for the nine teams in the final competition is to explore and map within 24 hours and with a resolution of at least five metres a large area of the seafloor of the Mediterranean Sea, off-shore the city of Kalamata on the Peleponnese peninsula of Greece. The selected area is about 500 km2 with depths up to 4000 m. The teams must explore at least 250 km2 of the area with their self-developed autonomous technology. 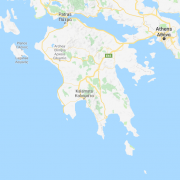 The autonomous devices will be launched from a control centre in Kalamata, where they must be recovered again at the end of their explorative mission. Fortunately for KM3NeT the selected area includes the future third installation site of KM3NeT. The high-resolution bathymetric map resulting from the measurements of the finalists will be made available to NCSR-Demokritos, one of the founding partners of KM3NeT and the managing institute of the KM3NeT-Gr installation site. The high-resolution map is a fantastic contribution to the implementation of the KM3NeT-Gr site. The KM3NeT Collaboration wishes all finalists good luck in their challenging endeavour! On Friday 21st of September 2018, a cooperation agreement was signed between the Iv. 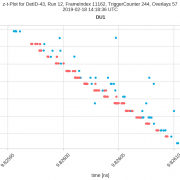 Javakhishvili Tbilisi State University (TSU) and the KM3NeT Collaboration. During a ceremony in Tblisi, Georgia, George Sharvashidze, Rector of TSU, Mikheil Nioradze, Director of the Institute of High Energy Physics and Christos Markou, Chair of the KM3NeT Institutes Board signed the agreement that confirmed the accession to the KM3NeT Collaboration of the group led by Prof. Revaz Shanidze. The KM3NeT Collaboration proudly welcomes its new partner and new colleagues. 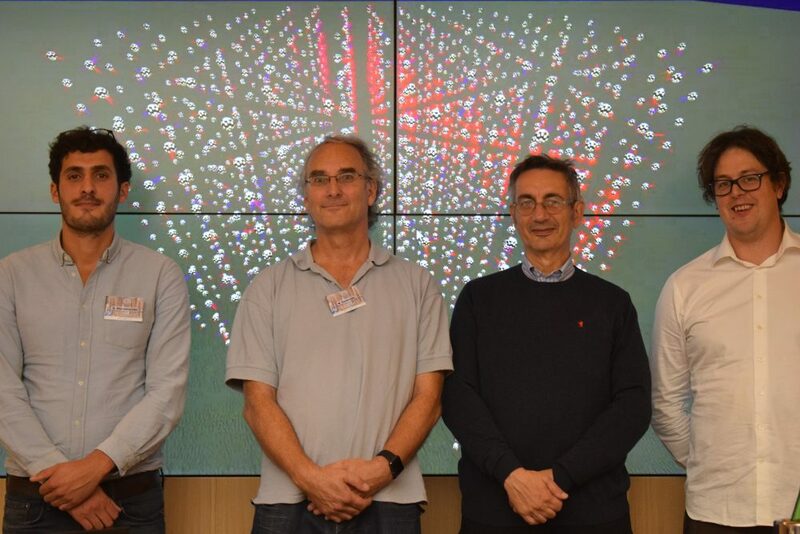 KM3NeT congratulates the researchers of the IceCube Collaboration for their compelling evidence for high-energy neutrinos originating from blazar TXS 0506+056. On 22 September 2017, the IceCube neutrino telescope detected a high-energy neutrino of about 290 TeV passing through the deep South Pole ice. When a series of gamma-ray telescopes looked at the same location in the sky they identified a blazar, TXS 0506+056, which happened to be flaring at that moment. In addition, IceCube found an excess of high-energy neutrino events with respect to atmospheric backgrounds at that location between September 2014 and March 2015. 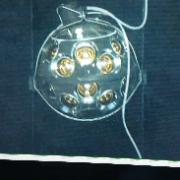 Details of the IceCube results can be found at their website. 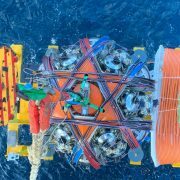 The ANTARES neutrino telescope in the deep Mediterranean Sea followed up the initial IceCube real-time alert, but no time coincident events were found. However, a time integrated search during the period 2007-2017, did yield a small excess of neutrinos in that direction. Have a look at their website for details. 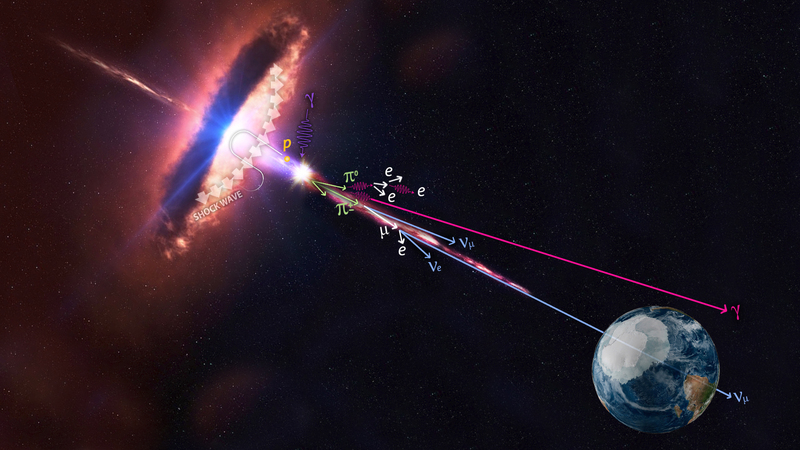 The first identification of an astrophysical source of high-energy neutrinos represents an important step forward for the fledgling field of multi-messenger astronomy. With its unprecedented angular resolution and complementary field of view, KM3NeT looks forward to soon joining IceCube and ANTARES in the hunt for the enigmatic sources of cosmic neutrinos. Exciting times are ahead of us! 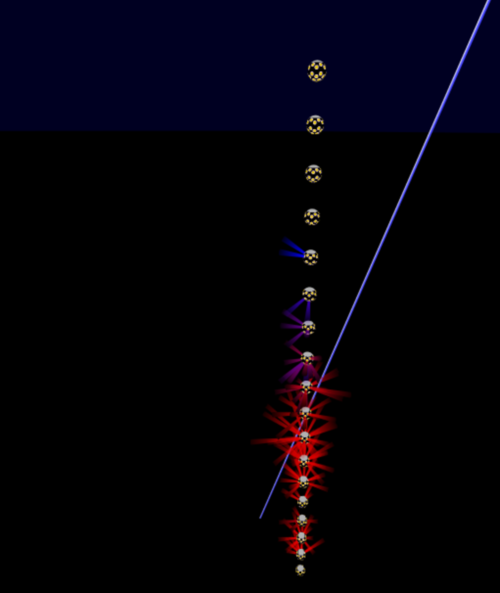 In this artistic rendering, a blazar is accelerating protons that produce pions, which produce neutrinos and gamma rays. 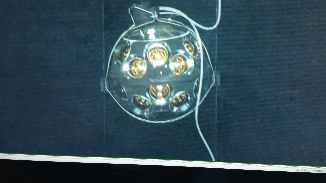 Neutrinos are always the result of a hadronic reaction such as the one displayed here. 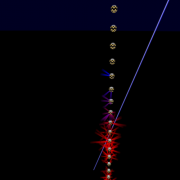 Gamma rays can be produced in both hadronic and electromagnetic interactions.